Zirconium Drier is a concentrated blend of metal carboxylates in mineral spirits, containing 12% zirconium and 5% calcium. Use with cobalt or manganese driers to improve through-dry and as a replacement for lead driers. Zirconium and calcium are effective auxiliary driers when used in conjunction with active driers, such as cobalt or manganese. Use Zirconium Drier to promote the through drying of paint film. Zirconium is the most effective replacement for lead driers. It also improves gloss and color when substituted for lead. Calcium functions as a pigment wetting agent to improve dispersion of pigments in oil and alkyd vehicles thereby improving gloss and hardness of paint. 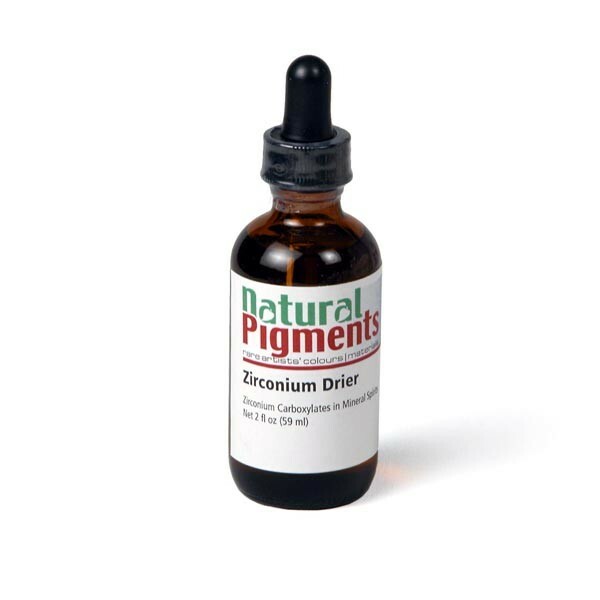 When ground with pigments it minimizes loss of drying capability of other driers. It improves the action of cobalt driers and is used in conjunction with them and assists in the "through dry" of oil and alkyd paint. Typically, 0.1% to 0.3% of zirconium metal is added to oil and alkyd paint based on the weight of the binder. Even higher levels may be required for high solids alkyd paint (low in volatile solvents).